to meet, share and listen with one another. More details about this conference will be posted soon. Please ask James Gatherer is you wish to know more. 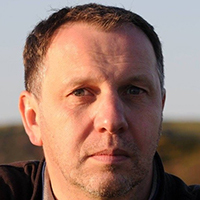 In this series of three lectures, Glasgow-based Practical Theologian and Kirk Minister, Dr Doug Gay will offer a candid, forthright and bold analysis of the state of the Church of Scotland and the choices facing it. First lecture: St Giles Cathedral, Edinburgh, 1st February 2017 at 6.30pm. Entry is free, and all are welcome. It will also be webcast live. He will explore what it means to be ‘presbyterian’ in today’s Scotland, in which even kirk members are ambivalent about their identity. Recognising the significant challenges facing the church in the coming decade, he will offer a manifesto for enacting structural reform, including key economic reforms, within the Kirk and will argue that change is essential to address deep seated problems of decline and dysfunction. All lectures will be broadcast live from St Giles Cathedral, Edinburgh from 6.30pm on each occasion. The first lecture (1st February) explores ‘what just happened?’ tracing the decline of the Kirk as a national institution since the 1960s. The second lecture (8th February) explores the relationship between the church’s understanding of its own calling and its response. 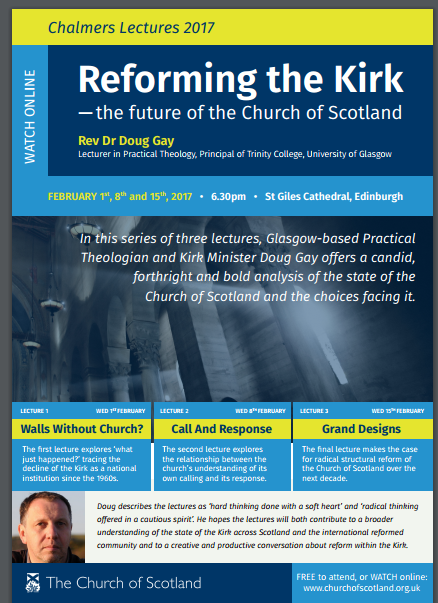 The final lecture (15th February) makes the case for radical structural reform of the Church of Scotland over the next decade.